Girls on the Move Week - “Girls on the Move” is back ! “Girls on the Move” is back ! "Girls on the Move", is an international project that was created by the organization “Elles bougent”. After the successful event in 2017, the initiative is back and better than ever, with more countries and young girls participating. Elles Bougent will rely on its network of 140 partners, bringing together companies, institutions of higher education and other public institutions to increase the size and scope of this year’s event. The success of Girls on the Move Day 2017 ! On March 8, 2017 Elles Bougent hosted their popular “Girls on the Move day”. Over 2000 girls participated in 50+ activities hosted by private and public industrial and technologic partners located in 17 different countries. Building off of this success, Elles Bougent has decided to change the format of this popular event, transforming the “Girls on the Move day” into “Girls on the Move Week”. 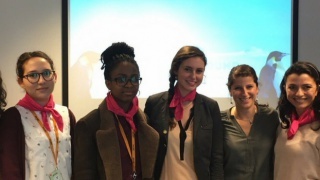 Instead of being held on just one day, this year’s event will feature seminars and other activities throughout the week, with a focus on the five countries that Elles Bougent is in the process of developing its female mentor network. Interested ? Want to participate ?